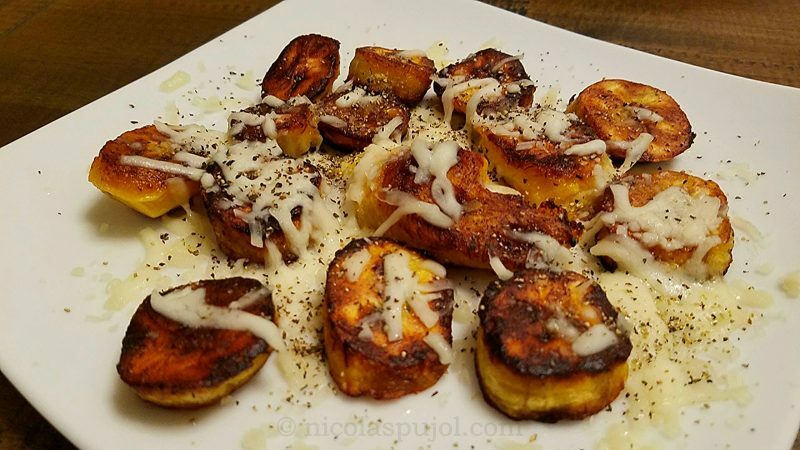 Plantains existed when I grew up in France, but I never ate them at the time. They were hard to find, especially in the country side, in the Alps and even in mid-sized cities. Nowadays it is still the case. When our family goes back to France, if we are in the Alps, the grocery store does not carry them. However, when we go to the larger food stores in Aix en Provence / Marseille, and of course if you live in Paris, you can find plantains easily. In the case of the US, given the proximity of latin countries and the fact that hispanics make up a large percentage of the US population, they are very easy to find. 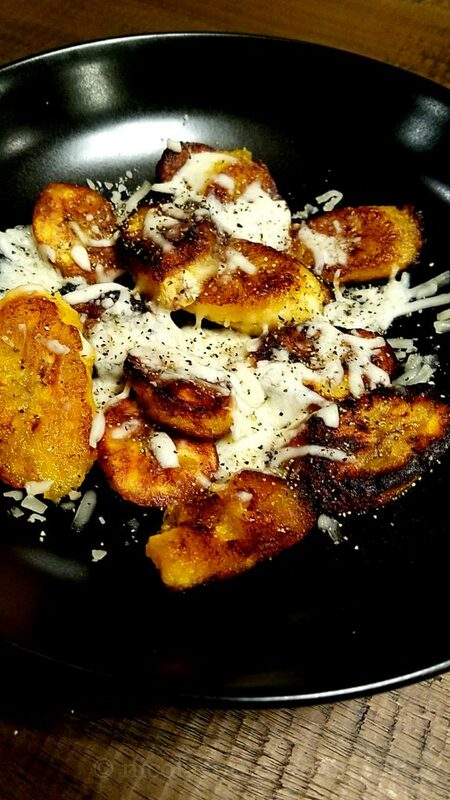 Layla makes plantains often. They combine sweet and savory flavors, and are cooked, unlike their cousins the bananas. This makes them a nutritious appetizer, containing fats, carbs, and being vegan. This dish introduces mozzarella for taste and decoration. You can use a vegan alternative if you prefer, such as avocado slices, or ground nuts. 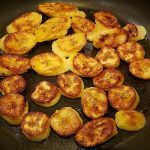 When making fried plantains (“platanos”), I usually keep it very simple and quick, so that I can move on to other things. Still it remains a delicious alternative to noodles, bread, or rice. 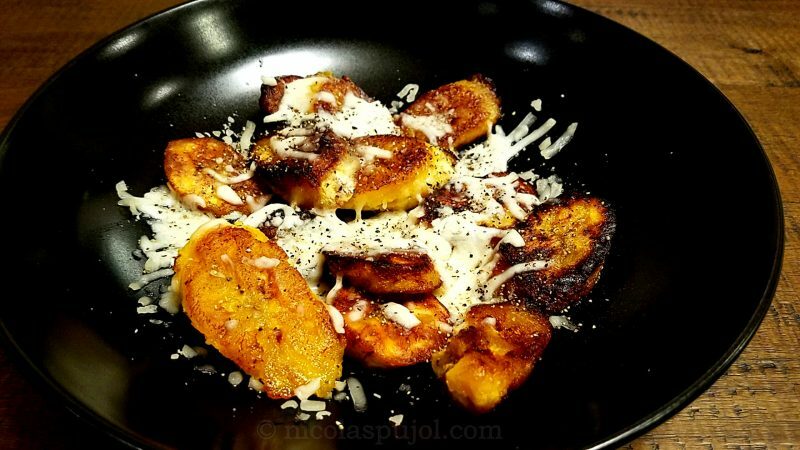 You can find plantains in different types, usually green or ripe. 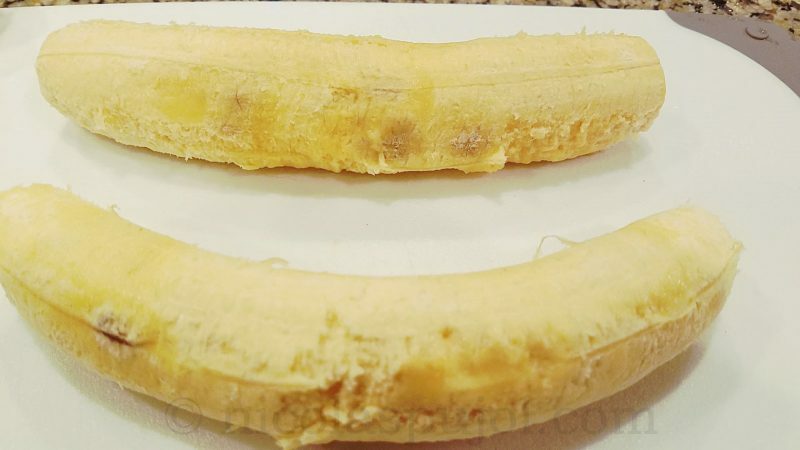 Green plantains are harder to peel the skin and take longer to cook. 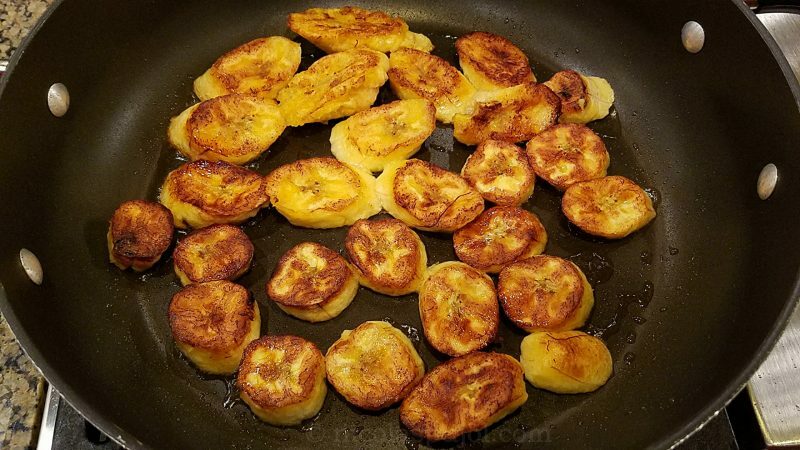 Ripe plantains tend to be best for frying. 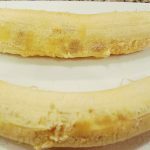 The skin on ripe plantains is also less sticky and much easier to peel. This recipe uses no salt, because there is already some in the mozzarella and the average diet in the days we live in contains way too much salt – so when it is not necessary, we can avoid using it. 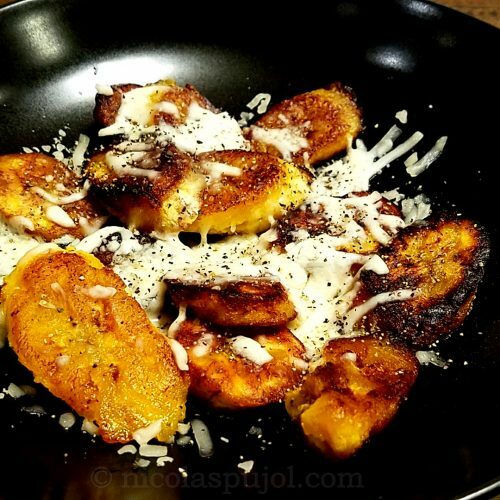 Fried plantain bananas with mozzarella cheese are easy to make and only use 4 ingredients. Recipe includes nutrition facts using avocado oil for cooking. In a large skillet, heat to medium-high, pour the avocado oil. 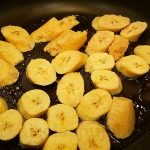 Peel and slice the plantains, place them to fry in the skillet. For this recipe the slices were approximately 0.5 to 1.0 inch thick. Within 3 minutes, flip them to the other side as they get brown. They should not be completely black or burned. Let them finish frying for another 2-3 minutes, then place in a plate. Sprinkle the mozzarella and ground pepper. Serve immediately. For a vegan alternative, replace mozzarella with avocado slices or ground nuts.